CaptainJack is an SSBM Sheik player from Japan, who is currently residing in Finland. He was one of the best players in the world during the The "Golden Age" (2004-2008). He travelled around the world, competing in Australia, Europe, and the United States. CaptainJack was formerly considered the best player in Japan, but he became inactive in 2008. On August 10th, 2014, CaptainJack initially announced his intention to return to the competitive Smash scene, in both SSB4 and SSBM. Despite this, he was unable to commit, as his marriage and personal matters took precedence. On February 29th, 2016, he announced another comeback for both SSBM and SSB4. He has maintained active interest in going professional. CaptainJack made his first appearance in the United States in August of 2004, at Tournament Go 6, placing 2nd, defeating ChuDat and Azen, but was double eliminated by the latter. Later that year, he would attend MLG San Francisco 2004, placing 1st, and defeating both Ken and Isai, then considered two of the best players in the world. In February of 2005, CaptainJack attended @M in Melbourne, Australia, and defeated Kupo, placing 1st. The next month, he attended Dutch Tournament 10 in the Netherlands, where he defeated Remen, placing 1st, and attaining another international victory. He returned to Japan, to host and participate in Jack Garden Tournament, one of the largest tournaments in Japan, and placed 7th. CaptainJack then won another European tournament at XTC3, defeating Amsah. CaptainJack then attended Zero Challenge 2, where he placed 7th in Singles, defeating The King, and falling to Ken and ChuDat. He won Doubles with Isai. In 2008, CaptainJack travelled with Masashi to attend Epita Smash Arena 2. In Singles, he placed 2nd, defeating Nnja, Calle W, and Armada, and was double eliminated by Amsah. He also placed 2nd in Doubles with Masashi, being double eliminated by Strawhat Dahean and Overtriforce. He would not attend any international tournaments in the years following. 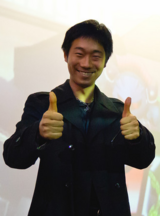 CaptainJack made his first international appearance in years at Apex 2012, placing 129th in Singles. In Doubles, he placed 33rd with Kou. He also notably played an exhibition match against other Isai, but Isai sandbagged and was easily defeated, much to the crowd's dismay. Following his marriage, and a commitment to reemergence in the competitive scene, CaptainJack began attending major tournaments in Europe, placing 17th at Kickstart 13, and 49th at B.E.A.S.T 7. CaptainJack's tag is derived from the German pop band Captain Jack. CaptainJack is one of the two smashers with a positive record against Armada, 2-0, the other being SilentSpectre, 1-0. ↑ Melee Legend Ryota "Captain Jack" Yoshida on returning to the game, world travels, and more. ↑ CaptainJack announces his return. ↑ CaptainJack announces another return. This page was last edited on April 25, 2019, at 16:35.